I'm thinking of adding LEDs to the headlights and tail lights of some of my vehicles. I know that is common practice on here, so I've searched for my answers, but haven't found them (or maybe just didn't understand). Anyway, my plan is to use a 12VDC power supply and have each vehicle on it's on toggle so I can turn each one on and off. My issue is that I do not understand resistors and what not that is needed to make this work. I've found the calculators on here and helpful information, but still can't grasp it. For warm white LEDs, the forward voltage (Vf) to each should be 3.3 volts. Depending how bright you want them, the forward current (If) should be between 10 and 20 milliamps. 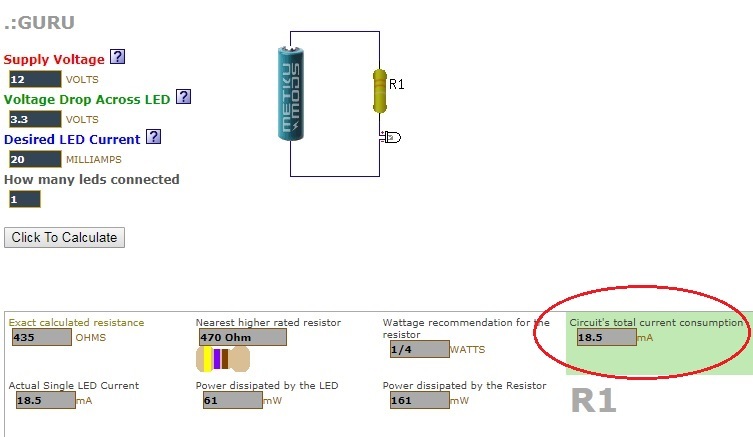 In the configuration shown in the above diagram, we can use the following formula to calculate the resistor value that you'll need. The nearest higher common resistor value is 470 ohms which is fine. The same calculation at 10ma gives a result of 870 ohms. So even a 1k (1000 ohms) would be alright in this situation. 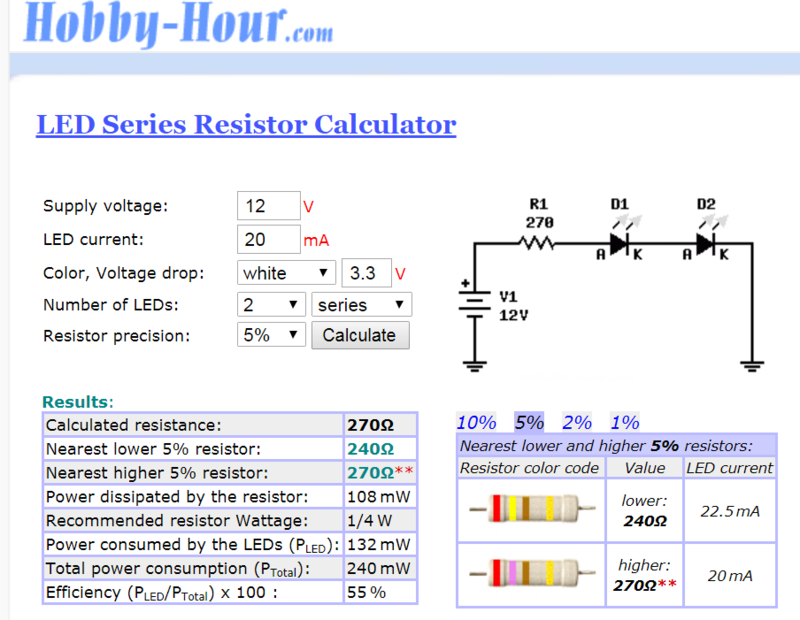 Having checked with some of the LED resistor calculators, they are recommending that the resistor should be 1/4 watt for the 20ma version but a 1/8 watt for the 10ma version. The 20ma version would be brighter than the 10ma version. Well...it depends on the resistor value. If you are limiting the current to 20 ma, then the wattage dissipated it I^2 times R or .000400 times R in watts. But double that for good measure. For example, .000400 times 470 ohms equals .188 watts. So doubling is .376 watts. I guess 1/4 watt resistor would be a safe choice even though it's not double. In the case of 10 ma, that would be .000100 times 470 or .047 watts. Doubling would be .094 and 1/8 watt resistor is quite adequate. Try these nice folks. They are Forum Sponsors as well. I have been buying from them for several years. They will even custom configure LED's to meet your individual requirements. Evan Design. Here's the link: https://www.modeltrainsoftware...llections/hobby-leds Very easy to deal with and very friendly if you need assistance. Most of that makes sense. So then I could use either a 10mA or 20mA for a warm white LED? The difference would be the brightness, is that correct? If so, is it the difference in the mA value or the wattage (1/4W vs 1/8W) that changes the brightness? Your reply has me confused. Could you please clarify? That is an option, thank you. I really like the turn signal idea. Thanks. I've actually bought quite a few ready-to-use LEDs from Evans Designs (and love them). Ultimately though, I'd really like to understand how to build my own. The reason being one - price and two - I like being able to understand how things work. To further confuse myself, what is the math/equation to determine how many LEDs I can operate on one 12VDC power supply? Mike: The difference in brightness is based on how many milliamps you run through the LED. The 20ma and 10ma values are just in the ballpark values. You should not go higher than 20ma though. Any more will tend to shorten the life of the LED. You can also go lower than 10ma which will dim the LED further. But I wouldn't run it at less than 5ma. So anywhere from 5ma to 20ma can be run through the calculation for the resistor value to give you the brightness level that you desire. The difference in wattage values has to do with the amount of current in the circuit. The resistor needs to be hefty enough to carry the load. 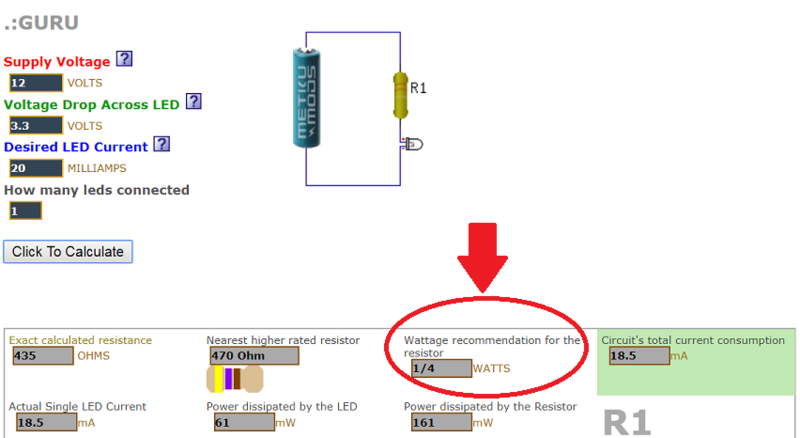 Higher current, higher wattage and the resistor should be rated to handle it without generating a lot of heat. The LED calculators on the Internet will tell you what the wattage should be. As far as the number of LEDs that you can run off of your 12vdc power supply, again it depends on how much current you want to use with each LED. If you use 20ma and you hook up 100 LEDs, you need 20 x 100 = 2000ma = 2A. Your power supply will be rated to be able to put out so many Amps. So a 1A power supply could run 1000ma / 20ma = 50 LEDs. I was messing with the LED calculators before I posted this thread, but didn't really understand what I was looking at. With what was mentioned above (and finding the same calculator), I think I'm starting to get the hang of this? 2. Higher current (20mA vs 10mA) produces? a larger wattage. That is why 20mA requires a 1/4W resistor and 10mA a 1/8W. Correct? power source (1000/18.5 = 54.054054). With a power source of 12VDC 2A, I could double that to 108 LEDs (2000/18.5 = 108.108108). Does it seem like I am in the ballpark here of understanding, or am I way off? Yes. Remember, we're dealing with a range of values. The higher the current to the LED the brighter it will shine. But 20mA is the limit. Beyond that is outside the LED specifications. Correct again. The 18.5mA value comes from our desired 20mA current that is limited by the standard resistor value from 435 ohms to 470 ohms. With ohm's law we get: V/R = I or 8.7 / 470 = .0185A. So the actual current is a bit less than what we are aiming for. The number of LEDs is just a straight forward division of available amperage from the power supply to the amperage consumed by the LEDs. But be aware that the ratings of a power supply may not be very exact. I'd say that you've got the right idea! Now... I'm going to further complicate things. I was looking for an Excel file someone posted on the forum and in another thread (here) found a link to an LED Wizard . In that wizard, using (Vs = 12VDC, Vf = 3.3V, If = .020A, 50 LEDs) it shows an array? that has one resistor for two LEDs. Is that scenario not possible in my case, and if not, what is the reason? I'm not questioning any information above, I just want to understand. Not sure what the question is, but if it’s having more than one LED in the string, yes you can. With 12vdc, three LEDs and a 150 ohm resistor would work. And you can parallel strings like that on one supply. Instead of having one resister per LED. I'm fine (and seem to understand) doing it the way Leo has shown, but was curious if this was an option too. Putting the LEDs in parallel relies on the LEDs being identical and share the current to result in the same brightness. I think putting the two LEDs in series would result in a more likely even brightness. In series, they would both positively have the same amount of current. Mike: Yes, there are other ways to wire your circuit with the switches. Placing the resistor in other places will change the calculation. To wire 2 LEDs in parallel using 1 resistor for them both, you take the desired forward current (If) of the LEDs and multiply by the number of LEDs (n). Again we'll use 20mA as the target current. However, parallel wiring of 2 LEDs from the same resistor is not recommended. Here's a note from this calculator page that warns about brightness variations. Note: You should avoid connecting LEDs in parallel with just one resistor shared between them. Identical LEDs can be successfully connected in parallel, but each LED may have a slightly different voltage drop, and the brightness of the LEDs will differ. If you want to connect the LEDs in parallel each one should have its own resistor. 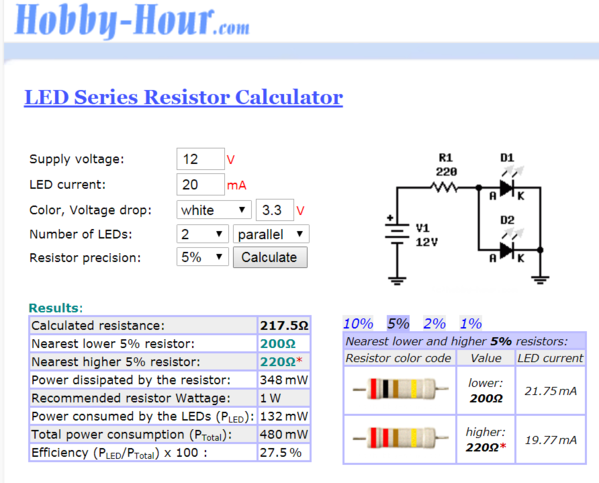 Calculate the value for a single LED and connect all the LED-resistor pairs in parallel. That seems pretty clear to me. I'm thinking I learned something something else in your last post.... that the image I shared in my last post, the two LEDs are wired in parallel. Is that correct? 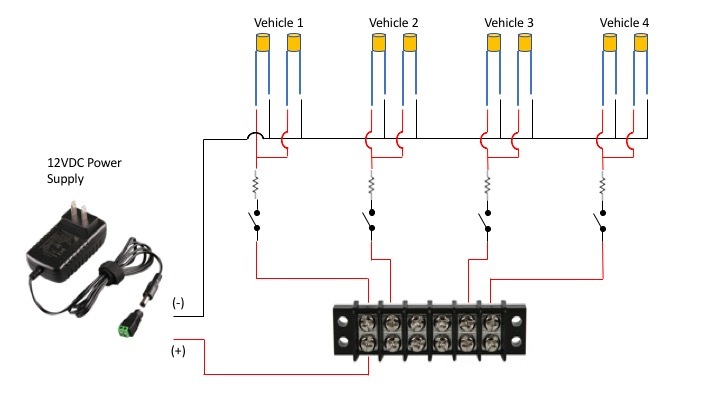 If it is, then I am assuming the image I created below is that of LEDs being wired in a series? Is wiring LEDs in both parallel and series wiring not recommended, or just in parallel? 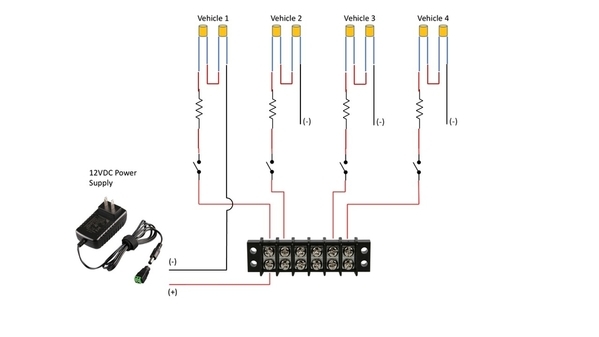 Will one LED (possibly) be brighter in both parallel and series wiring or just in parallel? 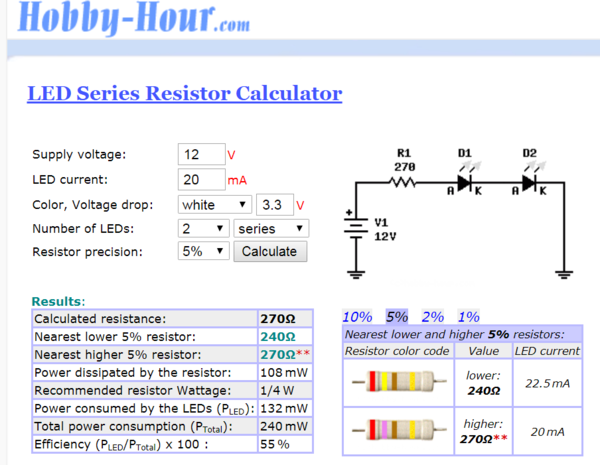 Again, I'm fine with doing one resistor per LED, but want to understand all of this. Plus, space may be limited in some places where having multiple resistors may not work. Mike: As Chuck said, wiring in series is better than wiring in parallel. When you split the circuit path between the 2 LEDs, you end up dealing with 2 independent calculations for voltage and current. So if the forward voltage of the LEDs do not match, you'll end up with different current as well and that could cause the LEDs to shine with different intensity. Series wiring is the recommended method. That way the current moving through the 2 LEDs will be equivalent and the forward voltage (which may vary due to manufacturing technique) don't have to match exactly. Yes. Your previous diagram showed the LEDs wired in parallel; each LED having a positive and negative to the supply voltage. Your last diagram shows the LEDs in series. That's the way to do it. That's the recommended configuration. You can wire in parallel as long as you include a resistor in series with EACH LED or LED series string. Draw a picture of that and you will see that the resistor in series with each LED or series string of LEDs tends to equalize the currents.